Quite a few things happened in the land of storage this past week. When it came to hardware, there were a raft of substitutions in the second half, and we also saw the appearance of a new benchmark that hopes to punt real-world workloads past the goalie. There was also, of course, an attempt to win back precious possession of, er, Tintri. Clear away the beer cans and get ready to rack up some wins with a week in the world of mad flash and spinning rust. IBM has a redesigned FlashSystem 9100 (FS9100) to offer the crowds... a go-faster and store-more redesign of the FlashSystem 900 (FS900) using proprietary or off-the-shelf small form factor NVMe drives. 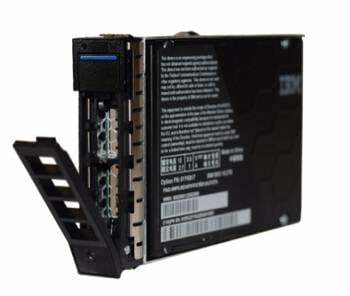 The FS900 used IBM’s proprietary MicroLatency Flash modules with 12 of them fitting across the front of the FS900’s 2U enclosure. These modules came in 3.6, 8.5 and 18TB capacities, using 32-layer Micron 3D-NAND TLC flash chips, and had a PCIe and NVMe protocol-class connection to the controller CPUs and DRAM. The FS9100 uses 2.5-inch form factor drives with an NVMe interface, and 24 can fit across the front of the FS9100’s 2U enclosure. There are air inlets on the front of each drive. FlashSystem 9100 and 24 front bays. FS9100 drives can either be commodity SSDs or IBM’s proprietary FlashCore modules, which are effectively a redesign of the FS900’s MicroLatency modules - proprietary IBM 2.5-inch NVMe SSDs in other words. Their capacity options are 4.8, 9.6 or 19.2TB and they use 64-layer TLC 3D-NAND chips. FS9100 FlashCore module. Note the air inlets on the front of the drive. This drive form factor redesign means maximum raw capacity changes from the FS900’s 216TB to the FS9100’s 461TB, using drives that are physically half the FS900’s drives in width and less than half in length. That means more space inside the box for other things. The FS900 drives have 95µs write and 145µs read latency, while the FS9100 drives are ever so slightly slower, with 100µs latency being quoted. IO can be parallelised across 24 drives instead of 12, which might well help, and the FS9100 uses either 8-core or 14-core Skylake Xeons with 768GB of what IBM is calling data cache. The less capable FS900 controller has two Broadwell Xeon E5 v2 CPUs and 64 GB of RAM. There can be two controllers for high-availability. In essence, the FS9100 has had a hulking great boost in CPU horsepower and DRAM capacity as well as doubling its storage capacity. This can be seen in the IOPS numbers, where the FS900 does 1.1 million random reads while the FS9100 does a claimed 2.5 million. This is, IBM notes, with cache hits and the FS9100 has 768GB of cache (DRAM we understand.) Without cache hits the random read OPS number is 1.1 million, the same as the FS900. To broadly summarise: the FS9100 has double the capacity, more than double the IOPS through memory caching, and three times the bandwidth of the FS900, and is NVMe-oF-ready, making it a worthwhile advance in IBM mid-range all flash array product technology. BOHH Labs has said it will offer secure data as a service in a way that’s analogous to an escrow arrangement. The product acts as a layer between the user or application and the back-end data store. The software provides database or specific file security by removing it from the source and storing it separately without changing the structure, enabling control of sensitive data. It has full text search capabilities, on non-secured and secured data, and supports chatbot technology for data to be accessed through keyboard, text-and-type from any device and voice commands. BOHH has an OEM agreement with Approyo, a SAP HANA Solutions Provider. It said sensitive and non-sensitive data residing in SAP HANA could be searched at once in real-time to extract insights without putting sensitive data at risk by hiding it away for access by authorized users only. As we revealed last week, DDN has inked a "non-binding letter of intent agreement to acquire substantially all of the assets of Tintri". If it does buy those assets, then it will have an enterprise all-flash array product line for storing VMs and their data. The products range from the T1000 remote/branch office array (2U x 24 2.5-inch slot) to a high-end EC6000 with its four EC6030, 6050, 6070 and 6090 models - all in 2U boxes. These can be clustered, with up to 64 nodes. An EC6050 base system with 92TB costs $846,016, an EC6070 with 92TB costs $905,358, and an EC6090 with 184TB is priced at $1,949,181. DDN’s own product line for traditional and enterprise-style HPC includes the EXAScaler (Lustre) and GRIDScaler (Spectrum Scale) parallel file system stores, using all-flash SFA200NV and 400NV 2U x 24 x 2.5-inch drive bays (shades on Tintri’s T1000), hybrid SFA7990 4U x 90 x 3.5-inch drive bay storage hardware, the IME burst buffer, and WOS object storage. The company sees the strongly growing AI market as another flavour of enterprise HPC and has a focus on that. Where would Tintri fit in? We'd imagine that DDN could use its SFA200NV and SFA400NV hardware as a base for Tintri’s T1000/EC6000 systems and sell the Tintri products alongside its existing HPC gear, with some data moving, integration and management software to bridge the two environments. The competition in the general enterprise AFA market is intense, with incumbents Dell EMC, HPE, IBM, NetApp and Pure Storage fighting it out with startups Apeiron, E8, Excelero, Kaminario, and Pavilion Data Systems, while fending off the HCI charge from Dell/VMware and Nutanix plus a host of HCI wannabees like Cisco, Datrium, HPE, NetApp and several others. DDN would surely look to some kind of differentiating/niching strategy to avoid mixing it in this fight-to-the-marketing death bear pit. Huawei’s OceanStor 550 V5 array has become the 12th fastest on the SPC-1 v3 benchmark, scoring 600,275 IOPS at a price/performance rating of $448.60/KIOPS and $15.49/GB. The Storage Networking Industry Association has produced its own Real World Storage Workload test spec for data centre storage. Er, why? What’s wrong with the SPC and TPC benchmarks? Well, the implication is that they do not use real-world workloads. Data centre means SAN, NAS, DAS, JBOF, JBOD, SDS (Software Defined Storage), Virtualized Storage, Object Drives, LUNs (Logical Units), SSDs (Solid State Drives), and other logical storage. Real-world storage workloads are IOs, or IO streams presented to storage at the File System, Block IO or other specified layer. These streams are modified at each layer of software abstraction by OS activities, metadata, journaling, virtualization, encryption, compression, deduplication and other optimizations. We’ll have to see whether storage suppliers publish results using this benchmark and then whether customers pay them any attention. Data protector Unitrends has announced Gen 8 of its Unitrends Recovery Series all-in-one backup appliances and version 10.2 of Unitrends Backup software. Details here. Management of large backup environments. Cloud storage startup Wasabi launched in the US last year and has two US-based data centres. It plans to open a EU based centre later on this year. 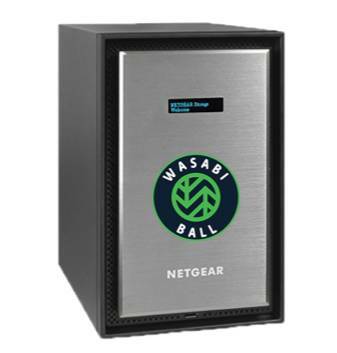 We’ve learned it has Wasabi Ball, a secure data transfer appliance that it has said is comparable to Amazon Snowball. It runs NETGEAR’s RN628X NAS and is mobile appliance that connects directly to a company’s network for uploading data. Wasabi Ball device. Um, shouldn't it be round? Companies can transport up to 87TB of encrypted data per appliance and directly into, or out of, Wasabi Hot Cloud Storage. WestLotto, Germany’s largest lottery provider and the control centre for the transnational lottery Eurojackpot – including 18 European countries, has selected Cohesity as its secondary storage platform. The UK's Fingerprint Technologies, a “one-stop shop” for business technology customers, is using the Scality RING software-defined storage (SDS) as the underpinning for its backup and archive cloud services offerings. Buffalo has announced that its TeraStation 3410 and 5410 models can be shipped in partially populated configurations using 4 or 8 TB hard drives. Cloudian and Storage Made Easy (SME) have launched what it described as a General Data Protection Regulation (GDPR)-ready, enterprise-wide file sync-and-share product, designed to eliminate the compliance exposure of external cloud-based file sharing services where personal data or company confidential information may reside outside the direct control of the IT organization. DataCore Software has been awarded a patent for stream architecture for data representation. It covers DataCore’s general data representation architecture that enables unique capabilities in its software-defined storage solutions, including continuous data protection (CDP), random write accelerator (RWA), and other technology within its enterprise data services. This is DataCore’s 23rd patent award. Fujitsu's latest version of Fujitsu ETERNUS Snapshot Manager (ESM). It enables near-instant disaster recovery and business continuity through array-based snapshot and data replication of Fujitsu ETERNUS storage systems. Hedvig's Distributed Storage Platform has been tested as a Veeam Ready Repository and Hedvig has become a member of the Veeam Alliance Partner Program. Details here. Imanis Data, which calls itself the machine learning data management company for the data-driven world, has an upgrade to its Imanis Data Management Platform (IDMP). It delivers new capabilities including enhanced ThreatSensetm ransomware detection, disaster recovery for Hadoop, and new rapid recovery testing. Mimecast, an email and data security company, has acquired Ataata, a cybersecurity training and awareness platform designed to reduce human error in the workplace. Manchester tech firm MirrorWeb has secured £1m of funding in its first round from the Northern Powerhouse Investment Fund, led by Maven Capital Partners. The cloud-native web and social media archiving company has been valued at £7m due to its rapid-growth potential. It has developed a scalable Software as a Service (SaaS) platform for frequent archiving of web and social media assets for businesses in the private, and public sectors. Paragon Software Group has released new Paragon Backup and Recovery Free – a set-and-forget data management tool with essential backup and recovery functionality for PC users. Recent CitiHub research discusses GPU-accelerated databases within the financial services industry. The report provided benchmarks and comparative analysis of these kinds of tools to assess their performance potential. SQream is among the products evaluated in the paper. Storage hardware and flash drive developer Storbyte introduced its SBJ series of hardware-defined storage solutions that offer a 100 per cent zero power, near-line/archive, tape-on-a-shelf alternative - which it claimed offers a verifiable data validation and protection plan capability that tape just cannot provide. The firm said its SBJ 4:96 provides 100 per cent zero power to an individual drive, individual drawer or dataset transparent to the host. Featuring 96 spinning disks in a 4U enclosure, the enterprise-class active archive, permanent true disk library offers 1,344TB of raw capacity complete with a full complement of featured data services. The SBJ series allows organisations to complete a user-definable, recurring 100 per cent total archive, background, data integrity audit to guarantee total data integrity. Windocks tells us its offering is a modern, open, Windows-based data delivery solution that competes with Delphix. Windocks enables the data delivery workflow managed completely by Database Administrators, where Delphix requires more dedicated storage admins. Veeam has announced Veeam Availability for Nutanix AHV - a data availability solution for applications and data hosted on the Nutanix AHV Hypervisor. Nutanix AHV users will gain the same backup and recovery capabilities that Veeam users running vSphere and Hyper-V already have. Updated Game over for Brit-based maker of real-time online gaming platform?